I like giving blood. I remember the day mom had a bleeding ulcer in her stomach and completely bled out. She needed five units of blood and that’s pretty much all that a human body can hold. I remember Diane telling me that she was the color of ivory lace. Scary!!!!! I’ve been giving blood for 10-12 years. But a little while ago — maybe 18 months ago — I kept getting turned away after the finger prick because I didn’t have enough iron. They said that I might have a heart attack or stroke mid-donation . . so I decided to try to build up my blood. Wouldn’t you know, all the things that are good for ya, like eggs, dairy, groats and steel-cut oats absorb iron and delete it from the body. So with this osteoporosis regiment of taking a LOT of calcium and vitamin D, and exercising, especially with weight-bearing days, I have somehow increased my iron. [Granted, I haven’t had oatmeal for a while either.] The other day I signed up for the Senior Blood Drive, a community service project. I got the finger prick and woo-hoo, I was in the zone . I showed them the vein I prefer, telling all sorts of facts about past donations where other veins rolled and they always ended up trying to ‘thread’ through them at great pain to myself. They believed me and tried it, but something went majorly wrong and within five minutes I had a Jacks-ball-sized lump of blood in the inside of my elbow. I was feeling like crap so they went to another vein in my left arm. She got the needle in, but I was starting to feel nauseous, my ears were hot and I was getting fuzzy. Although I was able to finish the full donation, I couldn’t get back to how I wanted to be feeling in the moment. The phlebotimist asked me how I was doing and I said I was really light-headed. She grabbed two ice packs and put them on some major veins in my neck and forced me to drink a pint of lemonade Gatorade, which I totally hate. 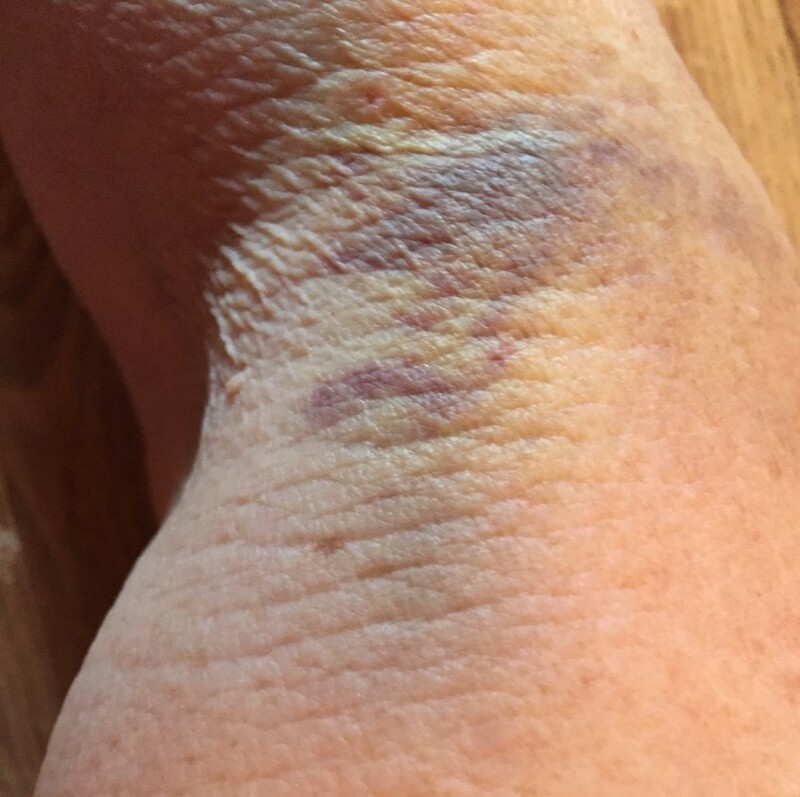 Long story short, at that very moment I remembered that the previous Saturday, four days before, I had had quite a bit of blood drawn for the Health Fair Blood Draw. I needed five vials for the tests I requested. Sheesh! I should have told them! I should have put two and two together. No WONDER I was light-headed. You can’t really see the ball under the skin but it is hard and feels like clay. I’m not sure I love to give blood anymore.